At the bake sales I do I like to provide a mix of cakes from traditional favourites to something a little bit different. 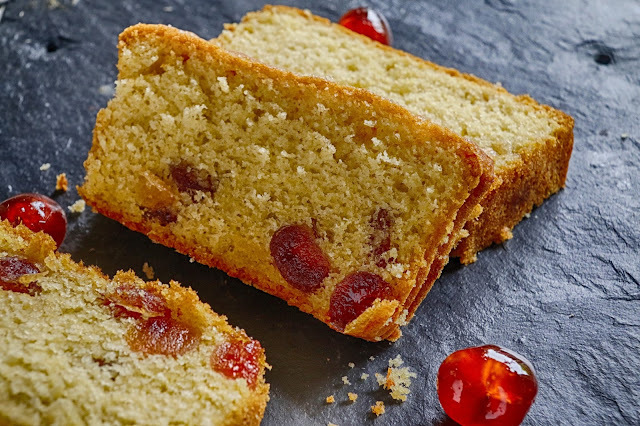 I find a good cherry loaf cake always goes down. The plainness of the cake is offset by the juicy cherries spread throughout the cake. Washing the cherries, drying them off and then coating them in flour may seem like a bit of faff but it is worth the effort otherwise all the cherries will sink to the bottom. 2. In a mixing bowl weigh out the flour, salt and baking powder. Put to one side. 3. Cut the cherries in half and wash in a sieve. Dry off with kitchen paper or a clean tea towel. Put in a bowl and cover with 1tbsp of the flour and make sure all the cherries are coated. Put to one side. 4. In another bowl cream the sugar and butter together until it is pale and fluffy. 5. Beat in the eggs one by one with a spoonful of flour with each addition. 6. Add the lemon extract and beat again. 7. Fold in the milk, flour and cherries. 8. Transfer to the tin and bake for 30 minutes to check if the top is browning too quickly. If so cover with a piece of baking parchment or foil before baking for another 15 minutes. 9. Check the cake is cooked by inserting a skewer and checking it comes out clean. Remove from tin and leave to cool on a wire rack.